Alopecia areata is an autoimmune, often reversible disease in which loss of hair occurs in sharply defined areas usually involving the scalp or beard, but any area of the body where hair grows can be affected. It is not known why alopecia Areata or other autoimmune diseases occur. It is thought that something triggers the immune system to react against one or more of the body's own tissues. Possible triggers include: viruses, infection, medicines, or other environmental factors. There is also an inherited factor which makes some people more prone to autoimmune diseases. About 1 in 4 people with alopecia areata have a close relative who is also affected. 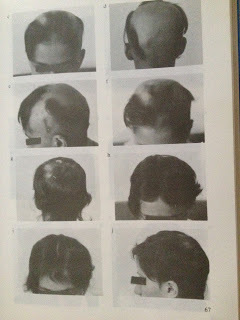 2.What is the outlook (prognosis) and treatment in for people with Alopecia areata in traditional medicine ? Mild cases of Alopecia Areata often get better without treatment within a few months to a year. In some cases, patchy baldness may come and go over many months or years. The size of the bald patch or patches and how long they last are quite variable. If less than half of the scalp is affected and no treatment is started, there is about an 8 in 10 chance of full hair re-growth within one year. With more extensive hair loss, it is less likely that hair will re-grow. Alopecia Areata itself won't damage your general health and so not treating will not lead to any general health problems. When considering any treatment choices, you should take into account the possible side-effects that some of the treatments may have. Generally, the success rate for the various treatments is probably not high. Also, there is no guarantee that any hair re-grown during treatment will persist once the treatment is finished. - Steroid injections- Topical (rub-on) ,Steroid , Immunotherapy ,Minoxidil. 3. What Homeopathy has to offer ? Homeopathy remedies teach the body how to heal sending the right message to your immune system. The body language to tell us that something it is not right is make us sick ,given us symptoms and diseases (fail in the immune system to fix what is needed ), or auto immune diseases ( an over reacting response , that attacks your on body). Homeopathy look to all signs that signs that your system send, mental, emotional states, physically too. We need to address the roots ( causes), that is way you need to go to an Homeopathy doctor. Vida Homeopathy Hair treatment, will work at scalp level, doing the same work, teaching your immune system (defense body mechanism) to fix the over reaction, at the internal level Vida Homeopathy Oral Spray, will teach your cell to absolve the mineral they need to inner balance and also will relieves the stress the triggers hair loss. Alopeceia areata like other autoimmune diseases has a good response to Homeopathy treatment, and are drug Free, No side effects.